A nice price point for a well above average range round that is sufficient for a lot of activities including home defense, target practice and hunting. But wait, a FMJ for those different things? 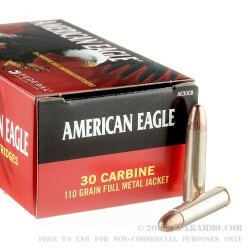 Yes, the 30 Carine is a potent round for all these activities and can easily achieve excellent results with a FMJ round nosed projectile. It’s been doing that for decades, where the mil-spec ammo has killed thousands of big game animals with a round nosed jacketed projectile. That same military ammunition was used to fight at least part of a war. It’s been used with relative frequency to defend against predatory animals and intruder alike. 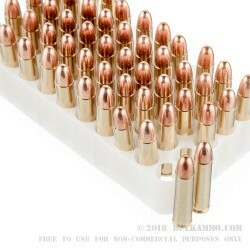 It’s also been a great stepping stone from .22’s into higher caliber rifles for many thousands of shooters. 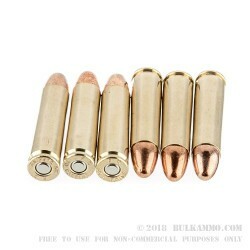 Plainly, the .30 Carbine is a cartridge with above average versatility and capability. 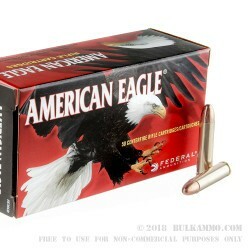 This American Eagle .30 Carbine round is an above average take on this proven round and it too, is usable for a plethora of activities up to and including hunting big game, defending one’s life and property, and making holes in targets. 1990 feet per second velocity and 965 ft. lbs. energy offer a lot of round for the money.